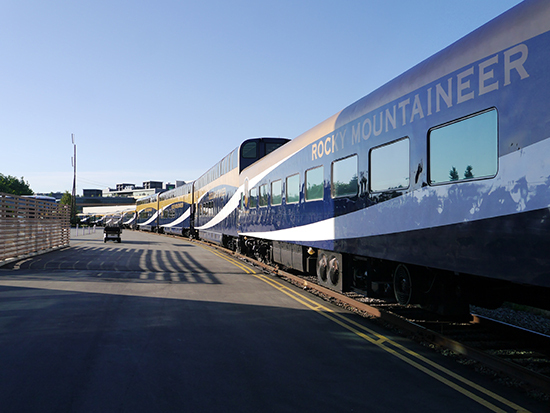 Traversing Western Canada - Vancouver, Banff, Jasper, Whistler, Quesnel - and now Seattle, Rocky Mountaineer offers one of the most iconic train journeys out there. Before you take a ride on the rails, we've been talking to the man who runs the show when you're on board. So David, tell us a bit about yourself and what you do. My name is David Aboud and I’m the Train Manager on board. 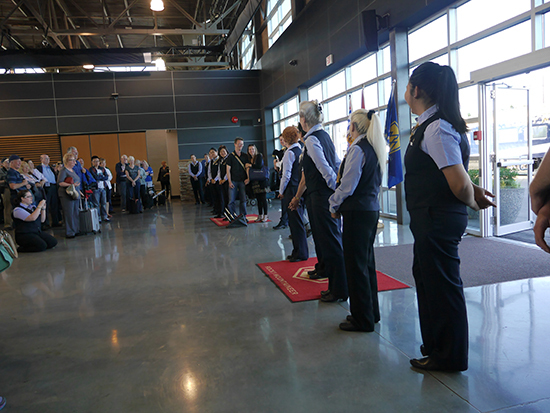 I work all the different routes that we have with Rocky Mountaineer and this is my 10th season, and our 25th season of rail, so it’s a significant year all round. It’s hard to say, they’re all so unique. There’s the First Passage to the West which is going up to Banff, then the Journey Through the Clouds to Jasper. The Kicking Horse River is beautiful, seeing the Pyramid Falls and Mount Robson and Jasper is spectacular as well. I just got back from our Rainforest to Goldrush route, which goes from Whistler to Quesnel to Jasper. A little quieter route up there, but just spectacular scenery. And now it’s nice going down to Seattle as well on our Coastal Passage trip. Are there any other particular spots you look forward to seeing on the different routes? Going through the canyons (First Passage to the West and Journey Through the Clouds). Most of our guests think Rocky Mountains, Rocky Mountaineer, but my favourite day is going through the canyons, through Rainbow Canyon, Black Canyon, it’s just spectacular, the scenery. I love that desert kind of landscape. Then there’s meeting of the rivers with the Fraser and Thompson, the confluence. There’s just something magical about going through this area because it changes so fast, from the Fraser Valley where we grow so many different things, to the barren dry landscape and then getting into the Rocky Mountains. It’s funny because, again, people associate Rocky Mountains with us, but it is a two-day journey so when you’re starting from Vancouver, it’s the second day until we get there. Even if you’re joining us on the westbound, you leave the grandeur of the Rockies and people aren’t sure what to expect the next day. They’re blown away by it as well because the scenery changes so rapidly over the two days. And what destinations do you like? Jasper is one of those places that’s kind of stuck in time, which is why it’s one of my favourite places in the world. It’s got this quality where it hasn’t really changed much in 35, 40 years; it’s got a nice feel to it. For me I’ve always found a way to work in travel. I’ve worked on cruise ships, I was in Sydney during the Olympics in 2000 running a restaurant and I’ve always found a way to travel at the same time. When I was working in Sydney I met a couple in my first week there and somebody had taken me up to the Blue Mountains to do the hike, so I was telling these people the story about it. They said they’d lived in Sydney 60 years and they’d never been to the Blue Mountains. It just makes you think: we always go somewhere else but we never explore our own backyard. And while I’ve lived and travelled a lot through Canada I hadn’t explored a lot of British Columbia and Alberta so it was kind of on my to-do list and the timing just worked out right with finding the job. It’s a unique work environment and I like to work outside the box a little bit. What was it like finally exploring the place that had been on your doorstep for so long? It was just amazing. The great thing is, after 10 years, you don’t get bored of it. It’s literally different every single day, whether it’s the weather, the challenges you might face out here. Everything’s different all the time. Speaking of the weather: how different is the Rocky Mountaineer experience when the weather changes? It’s a completely different experience. Using the canyons as an example, a lot of the times it is sunny and hot through here – it’s one of the hottest places in Canada – so just keeping our air conditioning up is a challenge sometimes. But even just with the clouds you actually can get better colour out of the photos sometimes. Every day looks a little bit different to the last. You get some cloud and rain when you get into the Rockies but it adds a little mystical quality to it. Have you ever done any of the journeys yourself for fun? For me, part of work is having fun! I’ve never actually done the journey as a guest but I have had friends and family on board. It’s always nice for somebody I know to come on and see it all. They know what I do, but I don’t think they really knew what to expect on board. 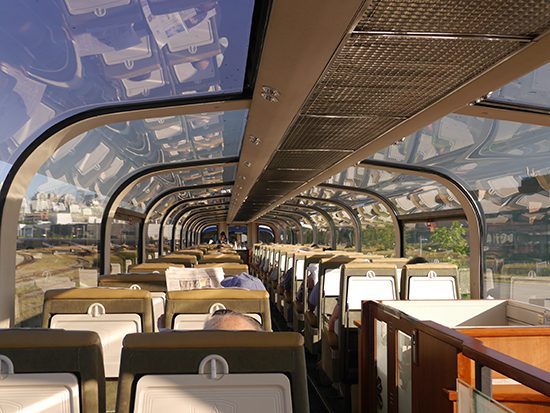 Tell us something not everyone knows about Rocky Mountaineer. It’s amazing because so much of our clientèle is from the US, the UK and Australia. Not surprisingly there aren’t a lot of Canadians who take the train. It’s just an awareness. 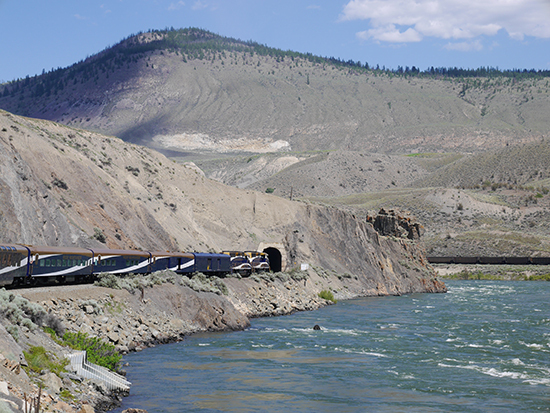 Even when I moved to Vancouver 20 years ago – another milestone for me – I think everybody assumed we had a train that goes through the Rockies but for some reason people are always surprised. Now we’ve finally started advertising a bit more we’re seeing more Canadians on. It’s nice to see how proud they are when they do come on. We’re still trying to get the word out within our own country though, which is funny. I had my parents on for their 40th anniversary a few years back and my mother, when she got back to Ottawa, I think she was our biggest advertisement. She was telling everybody and showing them the pictures! What sort of guests do you get onboard? Our age group is probably 55+ I’d say. It’s a bucket list item so a lot of people are retired and have waited – some have plans for years to come on. We are seeing a lot more from the younger generation coming out now. It helped when we were on the Canadian version of The Bachelorette a couple of years back and all of a sudden our numbers went up! So it’s interesting to see. We get a lot of honeymoon couples as well and people celebrating anniversaries. It’s funny how many people do this on their first visit to Canada and it’s usually packaged around a cruise. What we’ve found is, where we always assumed that we were an add-on for people coming to do the cruise, it’s actually the opposite. People had planned to come on the RM and while they’re here they happen to do an Alaska cruise at the same time. That’s good to know. Lastly: sum up RM in three words.